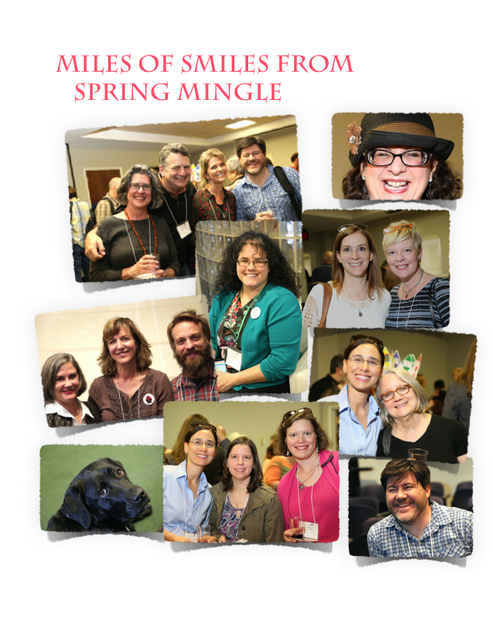 Lots of smiling faces at the 2016 Spring Mingle for Writers and Illustrators. Talent on hand included agents Tracey Adams from Adams Literary, Sally Apokedak from the Leslie H. Stobbe Agency. Stephanie Fretwell-Hill from Red Fox Literary and Peachtree Publishing editors Kathy Landwehr and Nicki Carmack along with art director Nicki Carmack. Art Director Laurent Linn from Simon & Schuster Books for Young Readers, and Stacey Barney from Penguin/G. P. Putnam’s Sons were also a part of the faculty.